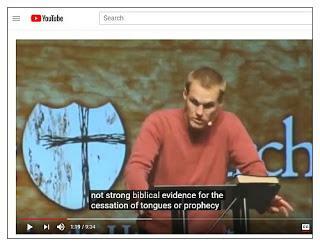 In October 2013, as part of the Truth Matters series, John MacArthur and a host of men such as Steve Lawson, Tom Pennington, RC Sproul, Justin Peters, and others participated in the Strange Fire conference. It was named Strange Fire from the verse in Leviticus 10:1. Charismatic Counterfeits: Do the Modern Gifts Meet the Biblical Standard? What are the Spiritual Gifts? What are the Sign Gifts? The Holy Spirit gives gifts to the people in the Body of Christ. Some of these gifts are known as sign gifts. These gifts are tongues, interpretation of tongues, miracles and prophecy. Sign gifts were given by the spirit for a sign to authenticate the Apostles' message as truly from Jesus. Also, the gift of tongues was intended as a message to Israelites that because of their unbelief and that they had come under judgment. Its purpose at Pentecost and shortly beyond was a fulfillment of the Old Testament prophecy of God's judgment to unbelieving Jews. (1 Corinthians 14:21, Isaiah 28:11-12). The sign gifts of tongues, interpretation of tongues, miracles and prophecy have ceased. They are no longer needed for a sign. No new prophecies are needed because the canon is concluded and closed. The remaining gifts are still and always in force. Folks who take this stance are known as cessationists (I am cessationist). The problem was and is that the Charismatic movement with its insistence on the continuation of these gifts had widened to include not just Pentecostals and Charismatics, but encroached into the more conservative segments of the faith such as Reformed churches. The movement had also become extreme with behaviors not only not from the Spirit but were outright demonic, such as holy barking, holy laughter, and false signs and wonders. It was Charismatic Chaos. Several self-identified Reformed pastors declared themselves continuationists. 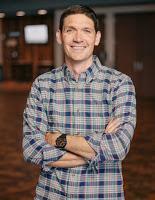 Reformed believing men such as John Piper, Tim Keller, David Platt, and Matt Chandler stand on the side of the sign gifts' continuation, leaving that door open instead of firmly shut as it should be. Their stance led and still lends credibility to the errant continuationist position. also state they believe the sign gifts continue, however carefully they say so and cautiously and primly. Many continuationists such as the below statement from The Village Church teach that cessationism means that ALL gifts have ceased. This is not the view of cessationists. Only the sign gifts as listed above have ceased, because their purpose for existing has ceased. "The position that best avoids these dangers is continuationism as it teaches that the gifts continue. This is the view held by The Village Church." 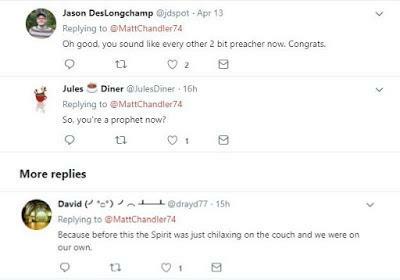 Chandler had preached in 2017 that he identifies as both Reformed AND Charismatic. The Reformers' Westminster Confession of Faith holds that the sign gifts have ceased. So, to be Reformed and contuationist would seem to me to be a denial of one or the other. There were no other tweets that day, this tweet was not part of a longer thread explaining anything or offering any other context or scripture or even joyful examples. It stood alone. It was a pronouncement of what the Spirit is doing, based on some vague observations, and an exhortation to not just his own flock but to the global body, based on his personal experience. It's sad to see the amount of likes and replies. 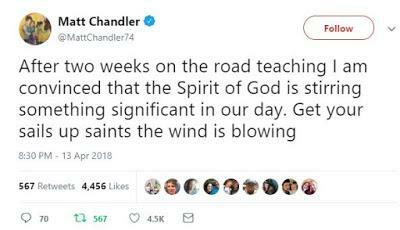 Out of 70 comments, only 4 were negative and 65 were positive, most searching scripture for "sails" and "wind" verses to match Chandler's pronouncement and eisegete back into his prophecy. Here are several of the sadly few naysaying response tweets. So...Chandler prophesied, no doubt about it, and it's a modern one, too, with none of the specificity. It follows the Charismatic template exactly: be convinced and convincing, offer no detail, no scripture, and be as vague as possible so that it can't be confirmed or it can easily be confirmed. But was it really a prophecy? "I've been traveling for two weeks teaching, and in Such and Such church I saw many people convicted over sin. In another church I saw many people come to Christ in repentance." "In another location I saw acts of charity and kindness done in Jesus' name such as... I praise the Lord for these works as the Bible says here and here". How would you test prophecy such as Mr Chandler issued, that 'the Spirit is stirring something significant?' (1 John 4:1). And as the tweeter replied and as I did also, the Spirit in only now doing something significant, but not before? What can one see that would convince one the Holy Spirit had been there? A revival like after Jonathan Edwards' sermon Sinners in the Hands of an Angry God? Even then, Edwards was suspicious of false repentance based on a heightened emotionalism. Would an observation of something false like fake raising from the dead or glitter gold dust falling or holy laughter? That would be a problem. But Chandler never says what. 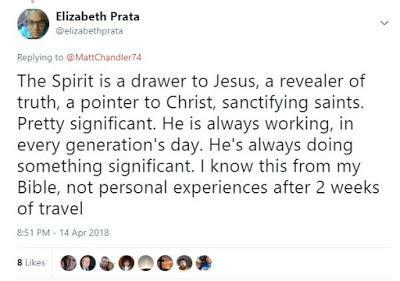 Only the vague, "The Holy Spirit is doing something significant and he is stirring, be ready..." No, most of the work the Spirit does is internal and not immediately observable. So, if we total all the "theologically cautious" charismatics with 100k+ followers we get 5.438 million followers. And that was five years ago. So yes, it matters. Error propagates, grows, and infects. It is very sad to watch. But my hope and glory is in Jesus, who always does right and who always does good. He is building His church and the good that I can't see when people stray from edifying doctrine doesn't mean it won't be there eventually in His plan. Please be "cautious" about following people who are continuationists. I'm sorry, I have not seen that believing that the sign gifts continue leads to anything good.